Angmir had the most liked content! Well proper proof reading and QC of Miyako will take soime time too - but yeah - making a patch takes usualy like 2 hours (from what I hear) Well it may take up to 10 if it is 1st patch made fro VN. Anyway there is no need to hurry with patch when it is not all done yet - besides Miyako curse havent been lifted yet ;p @Olivier - sure its nice of Kosuna to volunteer, but there is little fruit from his work, well at least yet. You never said how was the script he send - if it is good it will be good to have 2 translation to compare - will make proof reading much easier. if not for Dowolf you would still be waiting for the ramaing 1% to be done. It may be finished in a day in a year or never and in questionable quality of english. Plz refrain from using Dowolf translation when it is out and wait for Kosuna - ok ? With Majikoi beeing currently at finish, with all the work asigned. I think it is right moment to start gathering the crew for Majikoi S translation. Aspecialy since there are ppl ready to lend help waiting. I was about to write that knowing Dowulf, he has probably done the half of the work allready - but then your statement came ;] About Azengar and his patch - I think in the situacion where you have almost translated everything anyway, any patial patches are needless. So you should Aim now at 100% release only. IMHO. Although I am a bit concerned about patchmaking speed here. I know all diffrent cases maight be diffrent in difficulity but I know ppl doing patches to diffrent VN in minutes/few hours ! And they release partial patches even with very few % of progress every month almost. Maybe you can try contacting ppl with more experience on that matter, for tips etc. The TL team I was talking about is Yosuga no Sora TL team - http://trjr.wordpress.com/. Dowolf is contributing greatly to our comunity, he does what he likes while beeing usefull to others. If only bigger portion of the society was as "crazy" as him, world would be a better place. Japanese tend to use Chinese sometimes the way ppl in Europe use Latin. Proverbs. "smart" sentences and references to Chinese mythos etc. And even as they use the same Kanji (most of the time) there are ocasion where same sign has diffrent meanings, and most of them at least sound diffrently when spoken. I am happy Dowolf is working on Miyako - if anything this will shorten the time he would spend later on translation check. Now to another issue - Azengar ;p Honestly though I dont care about Agawe untill Miyako is compleate. Awesome news. So what happens now - I mean you can take some well deserved rest now, but if Kosuna still doest bring you the Miyako route for translation check for another week or 2 - do you plan to translate anything else ? things like that happen everywhere - Yandere did a good job overall - I read Majikoi many times and I havent saw many odd looking lines. It is more often when I see that translators give a bit of their own invention and change sentences significantly compared to original, but I dont mind as that usualy still carries the feeling of original. The error like what Ouraibaa found is probably lapse in translator mind of lack of editing of alpha version, QC should catch that - but then it is not the end of the world when in happens ! At current pace Dowulf will finish all sideroutes and everything before Miyako is over ... If Miyako was rly at 99% some 3 weeks back - wouldnt it be better to hend it to him back then ,,, I dont want to diminish the work Kosuna put into his translation, or sound ungreatfull (I am very greatfull belive me ! ) but we are reaching the point where everything else is done and we still missing Miyako, even as this initiative started as Miyako route translation ... 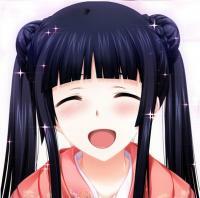 I prey we can finaly see the completion of Miyako route soon. That girl is cursed in game world and outside of it !